Mt.Amba(安波山) is a symbol of Kesennuma, Miyagi prefecture. It is about 239m tall mountain and has a great view of Kesennuma port and bay area. Amba means praying the safe ship and large haul. This mountain is also considered as the nest of Dragon in Fusui. Therefore, there are two dragon objects that made from the seashells. 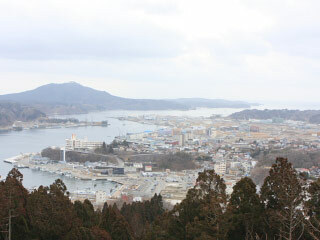 Mt.Amba is a popular mountain for people of Kesennuma. It is 239m tall mountain. There are observatories at 5th station, 6th station and the top. They have a great view of Kesennuma. At 5th station, there are two dragons that made from the seashells of Kesennnuma. At 6th station, there is an ocean view restrooms that chosen as the 10 best restrooms in Japan. On the top of mountain it has a great view of Kesennuma bay. It is also popular Sunrise spot in Kesennuma. It has also a great night view of Kesennuma.